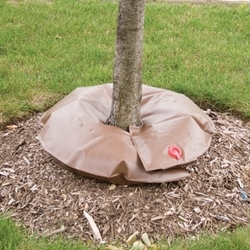 Treegator drip irrigation bags are durable, easy-to-use watering systems that provide deep water saturation directly to the root system of a new tree or shrub. These systems install easily in minutes without tools. Simply wrap the bag around the tree or shrub, then fill with water. The Treegator Original holds about 20 gallons of water. It’s for use on plantings with 1 to 4" diameter trunks, and will saturate continuously for 5 to 9 hours. You can zip two bags together to increase the diameter to fit up to an 8" trunk and increase the water capacity to nearly 50 gallons. Construction is durable green polyethylene with nylon webbing, black poly straps and green nylon zippers. The fill opening accommodates up to a 3" hose. 2-year limited warranty. The Treegator Jr. Pro is for use on plantings with up to 6" diameter trunks. It holds about 15 gallons of water, which will saturate continuously for 5 to 8 hours before refilling. Construction is brown PVC that is UV stabilized to withstand exposure to sunlight. 1-year limited warranty.